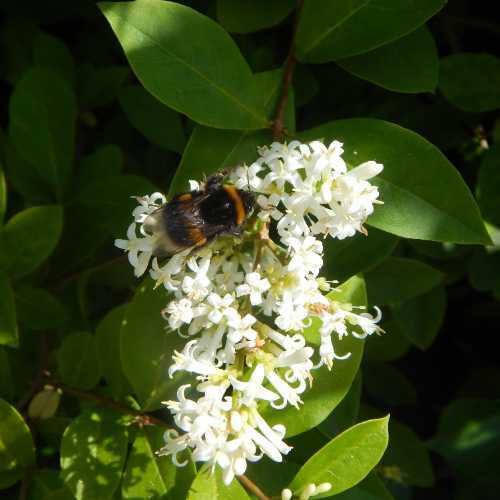 There are many wonderful flowering shrubs for bees. Here are 15 of my favourites – no doubt there will be a few you’d happily add to the list! This website receives many visitors from around the world – please check a shrub is suitable in your country (and not considered to be an invasive species) before including it in your garden. Please try to ensure the shrubs you purchase have been grown without the use of systemic insecticides. Look out for local plant fairs, and opportunities to swap with like-minded gardeners. If you have any bee-friendly plants going spare, why not pass them on to friends, gardening clubs and neighbours? 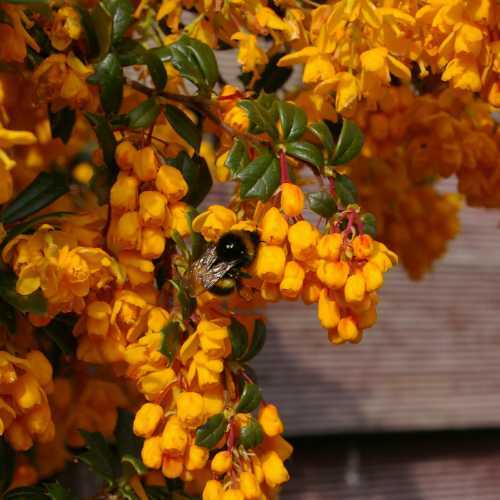 Berberis darwinii is evergreen, and is one of my favourite flowering shrubs for bees, due to the mass of lovely orange flowers appreciated by bees and hoverflies alike, especially in early spring. 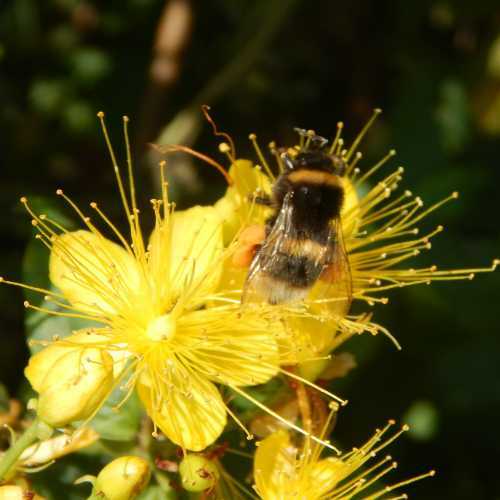 Early spring is when bumblebee queens are feeding frantically to establish their colonies. It's also useful for creating a prickly barrier plant if you are concerned about security. The flowers are followed by decorative blue berries. I was not sure whether the berries were attractive to birds, until I watched a blackbird snaffling a few – whether the berries are appealing to birds in all countries, I do not know. The leaves are small, and remind me of miniature holly leaves, although they are not so rigid. Sometimes, this shrub will flower again later in the year, although from personal observation, the flowers are not so abundant for the second flush. 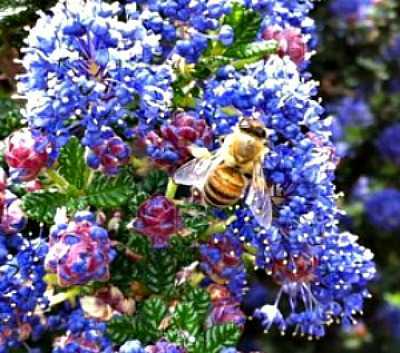 Ceanothus is a superb evergreen flowering shrub for bees - honey bees, bumblebees and solitary bees appreciate the lovely blue or blue and pinkish flowers. I like the earlier flowering varieties as again, they provide food for bees when foraging opportunities may be limited. However, if you have space, you can add a selection of different specimens to ensure extended flowering through spring to late summer. I have a page with more detail here. Cotoneasters can be trees or shrubs, and some are evergreen. For a flowering shrub. I especially like Cotoneaster conspicuous ‘Decorus’ for attracting bees. Cotoneaster flowers are followed by berries – often in autumn and winter, when hungry birds are especially grateful for them. Escallonia is available with white flowers as well as deep crimson red. I only have experience of the red varieties, which have lovely deep red flowers from spring through to summer (quite long flowering), and evergreen, glossy leaves. I have a further page about Escallonia here. Our neighbour has a good sized shrub, and Escallonia features in a number of public planting schemes around the area in which I live. Quite tolerant of a variety of soils as long as they are well drained. Likes sunshine, but I note my neighbour's shrub is in shade for part of the day. Great as a hedgerow plant. Many flowering hebes are fantastic for bees and other pollinators, including hoverflies and butterflies. 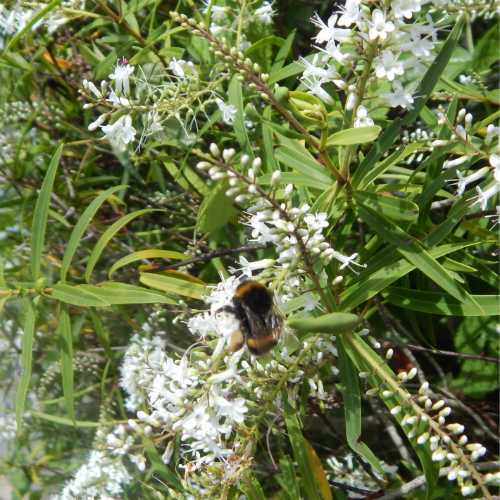 This particular shrub pictured above, gets covered in bees and hoverflies (they are very active as I write). The variety may be 'Charming White'. Many varieties are available, however offering purple, blue and white flowers – but not all hebes are flowering, so be careful in your selection. 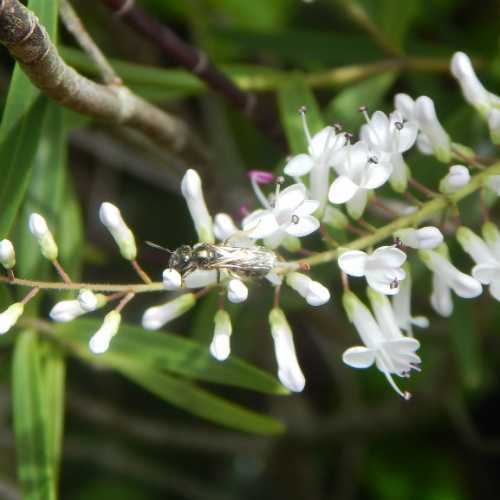 A 'must have' flowering shrub for pollinators! Some hydrangea offer apparently nothing of value to pollinators in terms of nectar and pollen – they are decorative only. However, there are a few which are loved by pollinators, and hydrangea paniculata is one of those. 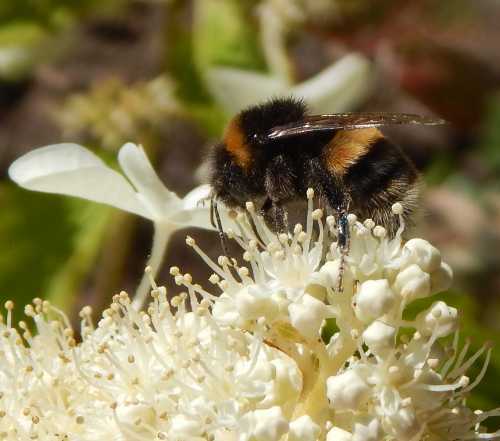 I have watched honey bees and bumblebees foraging on ours, and I love the soft clumps of white blooms. 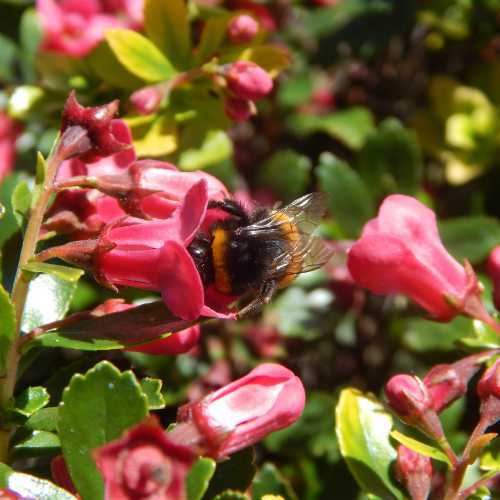 A wonderful flowering shrub for bees! Wonderful varieties available, such as Hypericum perforatum. I love this shrub – definitely a favourite! I especially adore the varieties with lots and lots of anthers loaded with pollen, and find it especially amusing when a bumblebee lands clumsily, as if it’s their equivalent of jumping onto a feather bed! Just look at all that pollen the bumblebee has gathered on its hind legs! 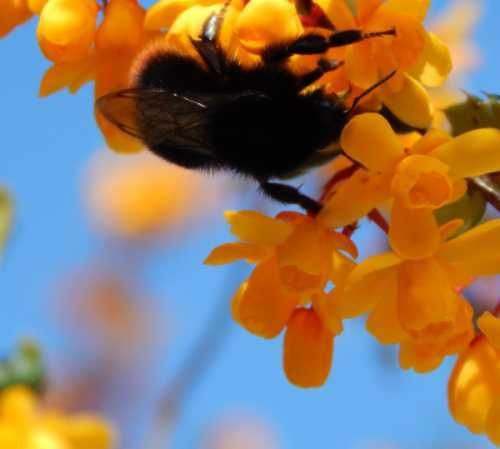 Yes, this flowering shrub provides absolutely loads of pollen for a variety of species of bees! The flowers are followed by decorative yellow ‘hip’ type capsules for some species, or green or reddish/brownish berries for others. We also have the wild variety in our garden. It pops up here and there, and produces fewer and smaller flowers than the cultivated forms, but the bees visit it nevertheless. 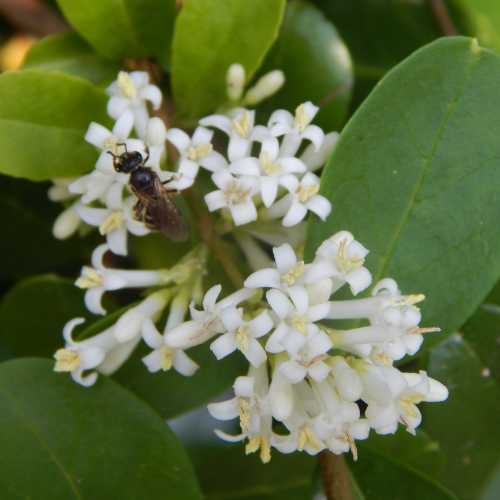 Privet: Ligustrum vulgare (Common privet) - and also Ligustrum ovalifolium 'Aureum' provide food for a variety of pollinators. It's an understated shrub in my view, but the white flowers are visited by bees, hoverflies and butterflies. This bushy flowering shrub is often used as a barrier hedge. It has small dark berries after flowering. Please note: Ligustrum vulgare is considered an invasive species in some parts of the world, so please check before planting. 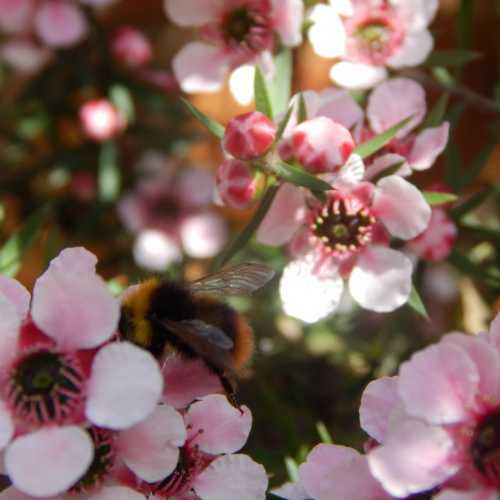 Manuka shrub – Leptospermum scoparium, is an absolutely wonderful flowering shrub for bees, and I recommend it heartily. 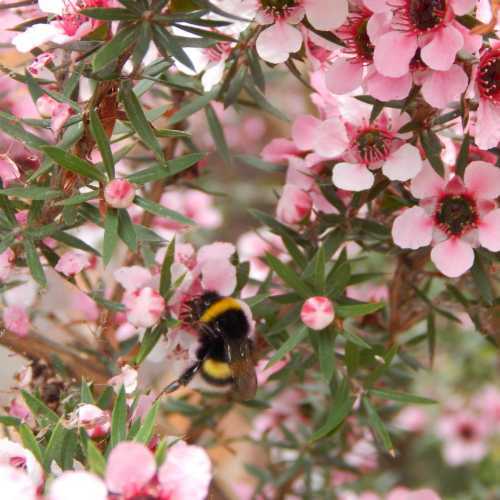 Leptospermum scoparium is evergreen, and is the shrub from which honey bees make Manuka honey. Bumblebees and various solitary bees love it too, and I have noticed that a little later, when the bumblebees and honeybees stop visiting so frequently, the hoverflies arrive. Quite long flowering from Spring. However, it needs a sheltered spot and plenty of sunshine. We originally had 2 of these – one was in a more exposed position and didn’t survive. The other is against a sunny, warm wall of our house. The pink flowers are lovely, and are surely dripping with nectar as it gets covered in bees! Firethorn - Pyracantha - gets covered in bees, and the gorgeous berries are adored by birds. Thorny, so it’s a good barrier shrub if you are concerned about security. Can tolerate some shade. 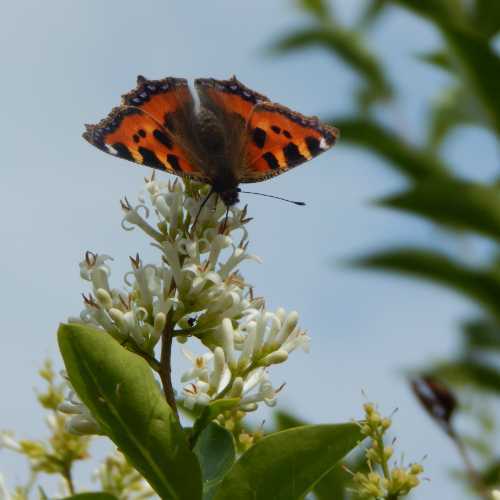 Try Pyracantha rogersiana, Pyracantha atalantioides, Pyracantha 'Golden Charmer' or Pyracantha 'Orange Glow' - but there are others available, also enjoyed by bees. Blackthorn (Prunus spinosa) - sloes, provides a good source of nectar and pollen for bumblebees, honey bees, solitary bees, butterflies and moths. Can be a shrub or tree, and is ideal for wildlife garden hedgerows. White flowers in spring, and very valuable source of food when foraging opportunities are otherwise limited. A good, thorny hedge. I especially love ‘Brocklebankii’ which has lovely pink flowers and soft green leaves. If you are wanting to add a feel of 'softeness' to your border, this would be a very good choice, along with Spirea japonica (mentioned below). A wonderful shrub for a cottage garden. The flowers of 'brocklebankii' provide food for bees in spring. Other varieties to consider are Koja, King Edward VII, Pulborough Scarlet or 'Tydeman's White', which has paler pink flowers, or 'White Icicle - Ubric' which is creamy white, and is also attractive for bees. 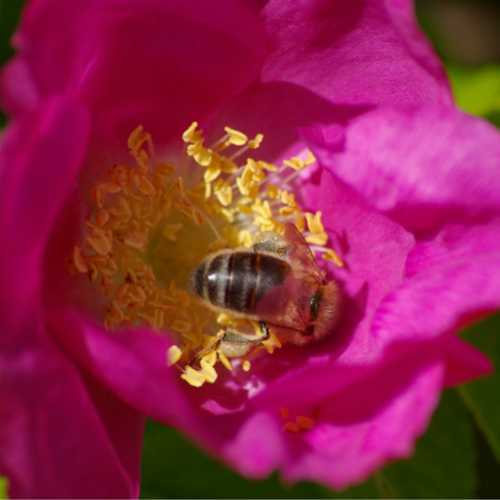 Not all roses are beneficial for bees, but they certainly like wild roses, and rosa rugosa. Rosa rugosa is simply one of my favourite of all flowering shrubs for bees. The roses are deliciously fragrant, and adored by honey bees, bumblebees and solitary bees of various species. 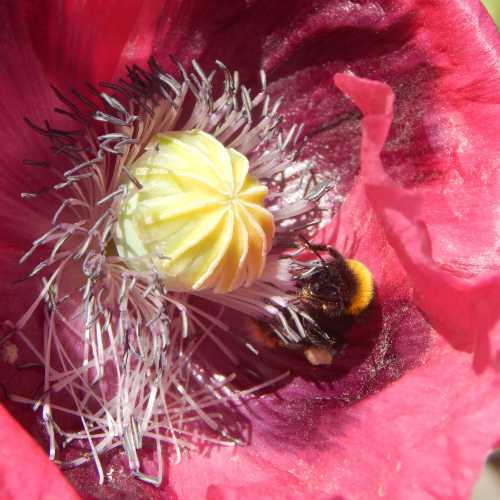 I especially love to hear the loud buzz from bumblebees as they ‘buzz pollinate’ to release the ample pollen – i.e. vibrate their flight muscles rapidly against the anthers. The lovely fragrant pink or white flowers are followed by gorgeous fat, decorative rose hips. If you are concerned about intruders, this is a great flowering shrub to choose, because it’s prickly, but it will need plenty of sunshine. 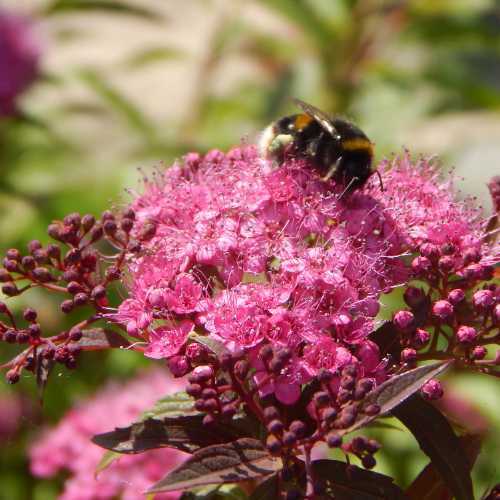 Various pink flowered varieties are widely available and attractive to bees. We have this shrub (variety – ‘Magic Carpet’ in our front border, and it gets covered in bees and hoverflies of all types for about a couple of weeks or so in mid-summer. I love the soft appearance of the flowers. I give it a clip in autumn to keep the shrub a moderate size, but do follow the instructions for pruning for the specimen you select. A superb flowering shrub for bees, Guelder rose (Viburnum opulus), is perfect for a wildlife garden, as the gorgeous white flowers are enjoyed by bees and hoverflies, and the lovely red berries are an important food source for a variety of finches and thrushes. It quite likes damp but well drained soil. It will tolerate some shade. Further information: see my page about notes on flowers loved by bees, or may page about why trees and shrubs are so beneficial for bees and pollinators.